This article will show you how to easily modify Windows8 and Windows8Touch themes and how to change the font of your application at runtime. When Telerik developed the Windows8 theme, we needed as little as 6 brushes for our controls. Exceptions are the Charts, ScheduleView, etc., which use some additional colors for their chart series, time markers and categories. All Telerik controls use brushes that are linked to one major singleton object that contains the colors to be used for the Windows8 / Windows8Touch themes. They are public so you can easily modify the colors of the theme at one single point. You can change the Windows8 / Windows8Touch colors by setting properties as shown in Example 1. Example 1: You can change colors in the Windows8 and Windows8Touch themes by setting the properties of the Palette object. The most important brush, AccentColor, controls the colors of headers and selected items. The MainColor brush controls the backgrounds. Other brushes are used at various places but as long as you do not pick the same colors for different brushes, your design will be alright. Since the PaletteInstance is a DependencyObject, you can also animate the colors at runtime. Figure 1: Some of the possible looks you will be able to easily achieve. Example 2 shows how to use the resources to achieve the style of the buttons in Figure 2. Figure 2 shows the result of styling your own interface (Example 2). All Telerik controls use resources that are linked to one major singleton object that contains the FontSize and FontFamily properties used for both themes. Those properties are public so you can easily modify those theme resources at one single point. The property for the most commonly used FontSize in both themes is named FontSize and the property for most commonly used FontFamily resource is named FontFamily and it is set to Segoe UI. Bigger FontSizes are used for headers and footers while smaller FontSizes are used for complex controls such as RibbonView, Gauge, etc. Example 3, shown after the note below, shows these resources and their default values for the Windows8Theme. You can modify each of them based on your needs. Example 3: Setting FontSize and FontFamily properties to use in Windows8 and Windows8Touch themes. The Q1 2013 release of Telerik UI Silverlight introduced features that allow you to dynamically change the FontSize and FontFamily properties of all components for Windows8 and Windows8Touch themes. As Example 4 shows, you can change the default FontFamily from "Segoe" to "Calibri" and the FontSize from 12 to 22 on a click of a button. 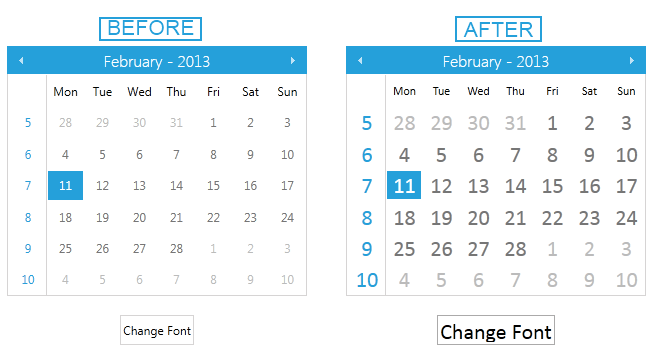 Example 4: You can increase the FontSize of a RadCalendar with the click of a button. Figure 3 shows a comparison of the application before and after the button is clicked. Figure 3: You can click a button to change FontSize.